There is not much to say about this CD, except that it will take a firm place among 10-15 best ever CDs in the entire Leo Records catalogue. This music can be a hint of what Miles Devis might have achieved in his later years had he been able to rise above the banalities of rock and jazz fusion. This is some mysterious, cosmic, brooding music like nothing you've heard before. 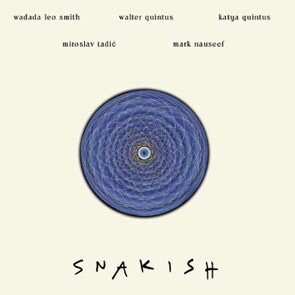 Wadada Leo Smith plays his great trumpet, Walter Quintus - computer & processing, Katya Quintus - voice, Miroslav Tadic - classical & baritone guitar, and Mark Nauseef - percussion & live electronics.